Once we restore and refinish your floor, we are proud to continue supporting you with cleaning and maintenance services to help preserve your wood floors and prevent damage. GJP Floor Sanding Surrey is proud to offer floor maintenance aftercare packs and we will provide a free cleaning and aftercare kit on all orders over £500. When we provide you with a quote for our floor restoration and installation service, we will tell you upfront what your options are for cleaning and maintenance. For floors that are finished with lacquer, we provide Bona Wood Floor Cleaning Kits, while Bona Soap (formerly Bona Carl’s Cleaner) or Bona Hardwax Oil Refinisher are available for floors that are finished with oil or hardwax. 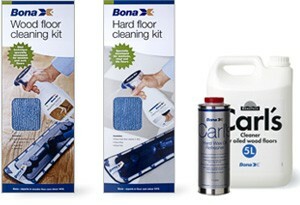 Bona is a Swedish-based company and an international leader in wood floor sanding, finishing, and cleaning. – Wait at least two weeks before applying any cleaning or maintenance product to wood that has been finished with lacquer by our Surrey floor sanders (click here to learn more about our finishing process) . – Place mats or throw rugs at exterior and interior doorways to help trap dirt and grit and prevent scratching, denting, or dulling your wood floor. – Use either soft plastic or fabric-faced glides on furniture surfaces that come into contact with the floor to avoid scratching the wood, and pick up furniture that is being moved. – Use a humidifier to minimise wood movement and avoid damp-related damage, especially during wet, winter months. Here at GJP Floor Sanding Surrey, it’s our pleasure to provide our customers with a free floor maintenance pack upon completion of their project. This contains some of the essentials to keep a floor looking great. We also have an extensive selection of wooden flooring cleaning products, with highly regarded detergents such as Bona Soap, and other products such as Bona Hard Wax Oil Refresher. To help maintain your floor, regular cleaning is necessary. You should use brooms or vacuums to help remove dust and dirt. In case a liquid or food is spilled, use a slightly damp towel to clear the spill as soon as it happens. Try to avoid using water to clean your floor. We will help you pick the recommended cleaner that will not only clean your floor, but also preserve the wood and protect the shine. If cleaning fails to restore the wood’s shine, GJP Floor Sanding is here to help you if you need to recoat your floor. – Applying maintenance or cleaning products on wood that has just been lacquered. – Using products meant for vinyl or tile floors on wood, which can make your floors slippery and look dull. – Using a wet mop to clean your floor. Standing water can leave stains on the wood and can result in damage or damp-related problems. – Using hard cleaners, such as oil soaps, on floors with a lacquer finish, which can create problems when you want to put a maintenance coat on your floor. – Dragging furniture across the floor.